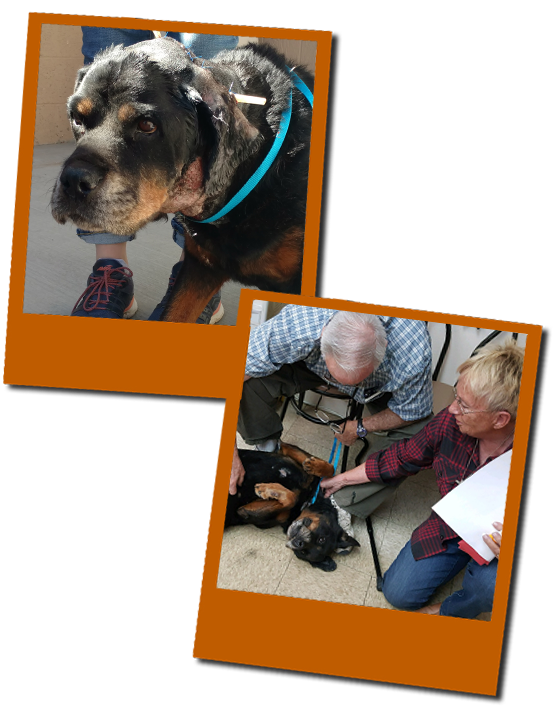 When sweet Bella, a 7 year old Rottweiler, was found wandering in the desert 60 miles from Kingman, Arizona she was in awful shape. She was suffering from a serious, life threatening head wound and several lacerations on her body and legs. Alone and in pain she had been fighting for her life for almost 2 weeks in the desert’s extreme summer heat. Thankfully, she was found by a good samaritan and brought to Yavapai Humane Society where our clinic team quickly assessed Bella’s wounds. Our team thought the wounds, which included a head wound so severe part of her skull was visible, were most likely from fighting off a wild animal such as a coyote. Bella clearly needed surgery as soon as possible and our team went into action. When Bella came out of surgery she we treated her to minimize her pain and help her recover from malnutrition. Bella’s sweet personality made it clear to us she had a loving home with people who missed her. During her recovery she gave our team members lots of gentle kisses and tail wags. Maybe it was her way of thanking us for caring for her. Thanks to the Facebook rescue community Bella’s story was shared over 1500 times. Many reached out to Yavapai Humane Society asking for updates and offering to donate. A link was created online for people to help fund Bella’s care. We are happy to report Bella is doing well. This morning an elderly couple came into our lobby with tears in their eyes. They told us their dog had been missing for 15 days and they feared the worst until they read Bella’s story on Facebook. They said her name was Ebony and they wanted nothing more than to take her home and give her loving care as she continues to heal. We took the sweet distraught couple to see Bella and confirm it was their missing dog. As soon as Bella spotted her parents she perked up. Her excitement was evident in the tail wags and kisses she gave her parents. Our staff was overcome with emotions and tears as we watched the exciting reunion. We could not ask for a happier ending to Bella’s story. Bella is a survivor, and we’re thankful our caring compassionate team was able to care for her. Tonight Bella will sleep safely and comfortably in her own bed with thoughts of wandering hurt in the desert far from her mind.